BENEFITS : - Enjoy a fresh faced feeling wherever you go with Kara natural face wipes. Made from 100 percent viscose, these refreshing wipes won't leave behind residues of lint, gentle ingredients that infuse your skin with the moisture and nutrients it craves. 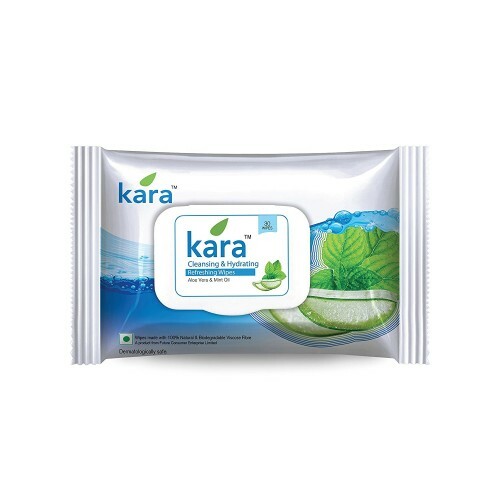 ALCOHOL FREE: - The bio degradable wipes from Kara are eco friendly and perfect for boosting freshness you can use these alcohol free wipes for cleaning excess dirt and oil from face and neck. SKIN :- Proven to cleanse and moisturize sensitive skin without causing redness or irritation, these products help your skin look and feel its best. Remove makeup, cleanse and tone in one easy step. These face cleansing wipes are clinically shown to clean sensitive skin without causing redness or irritation. QUICK AND EFFECTIVE - Clean and remove dirt and oil from your face or moisturize and clean after a shave, great for Travel. Ideal for getting and keeping healthy looking skin. 100% natural and Biodegradable, thus environmentally friendly. Packaging : - The unique packing system of Kara refreshing facial wipes help in locking the moisture of the wipes for a long time, thus avoiding dry up till the pack lasts. The wipes are packed in a reseal able label making it easy for you to pull a wipe and later reseal the pack.